The point of group vacations is to be together, so why split up, pay more and enjoy less in cramped and expensive hotel rooms? With a huge selection of Orlando vacation rentals, many of which are next door to one another, VillaDirect is the perfect option for group vacations and travel. Staying with VillaDirect in Orlando vacation homes can save your group between 40-60%, especially when compared with similar hotels! However, in our homes, you can enjoy luxurious amenities like private pools and spas, full-size kitchens, and private master bedroom suites. Many homes include game rooms, home theaters and more. All have telephones, FREE Wi-Fi, flat-screen HDTVs, and DVD players. A dedicated member of our Guest Services team also works with you to plan every detail of your group getaway. Including everything from finding the right accommodations to suit your needs, to making arrangements for extra-special occasions like weddings, birthday parties, and other festivities. Let’s say you are traveling with a party of 10. If you book a hotel room at an average 3-star hotel in the Orlando area, a great rate could be $89 a night. For three rooms (assuming you are OK with sleeping four to a room!) that rate becomes $267 a night. Add in standard taxes and fees, and that bill would be over $2500 for the week! If you are traveling with more than 10 people, that bill could end up even higher. Alternatively, you could book a spacious FIVE bedroom home rental for that very same week, and it would cost less than $1200, even after taxes and fees. That is over a 50% savings on lodging alone, and you are enjoying more space, more privacy, and more standard amenities for your money. 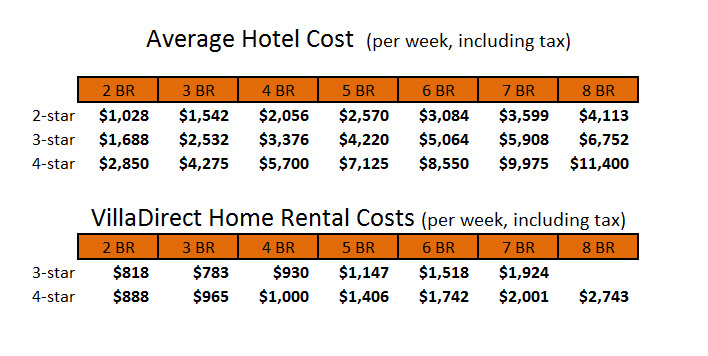 With larger homes for bigger parties, the savings over comparable hotel accommodations are even greater. Plus, every VillaDirect Vacation home is just minutes away from all of Orlando’s top attractions, including Walt Disney World® Resort, Universal Studios, and Islands of Adventure.